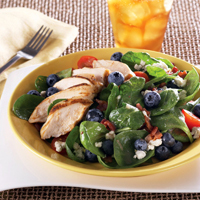 Heat up this yummy spinach salad with a savory bacon dressing. In a skillet, over medium heat, sauté bacon until crisp, about 7 minutes. Add onion; cook, stirring, until translucent, about 4 minutes. Add sugar; cook, stirring, 1 minute. Deglaze pan with sherry. Add vinegar and 6 ounces water; bring to boil. Reduce heat and simmer 5 minutes. At service, in a large bowl, toss spinach with 8 ounces of the hot dressing. On each of four large plates, divide dressed spinach (about 5 cups per plate). Sprinkle each serving with 1/2 cup blueberries, 1/4 cup tomatoes, 1/4 cup cheese crumbles and 1 tablespoon bacon bits.